A friend recently gave me a book called Drives of a Lifetime, published by National Geographic, which covers 500 of the world’s most spectacular road trips. 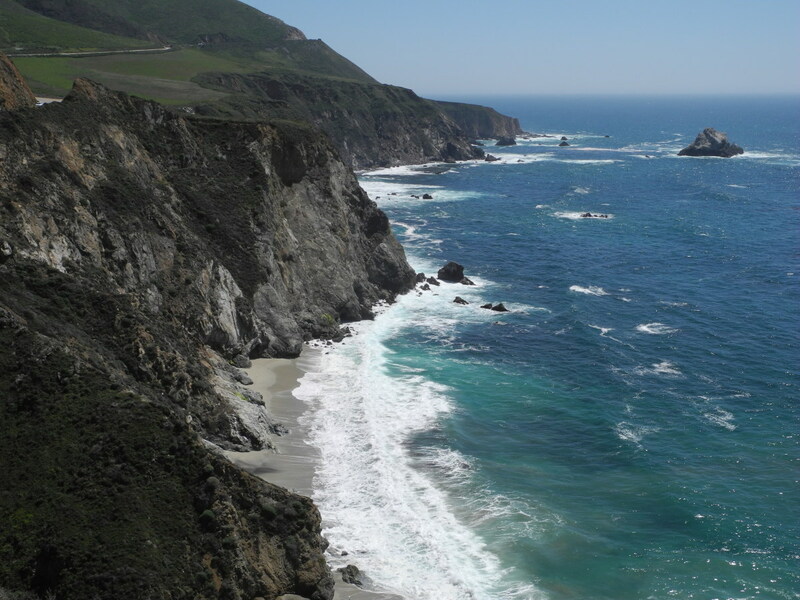 California Route 1 along the Big Sur coast made the list. This 125-mile drive from Morro Bay to Monterey begins through rolling pasturelands, soon changing to forest and a winding cliff-hugging road, 1,000 feet above the rocky beaches and surf. Multiple state parks are along the route, as well as the settlement of Big Sur itself. 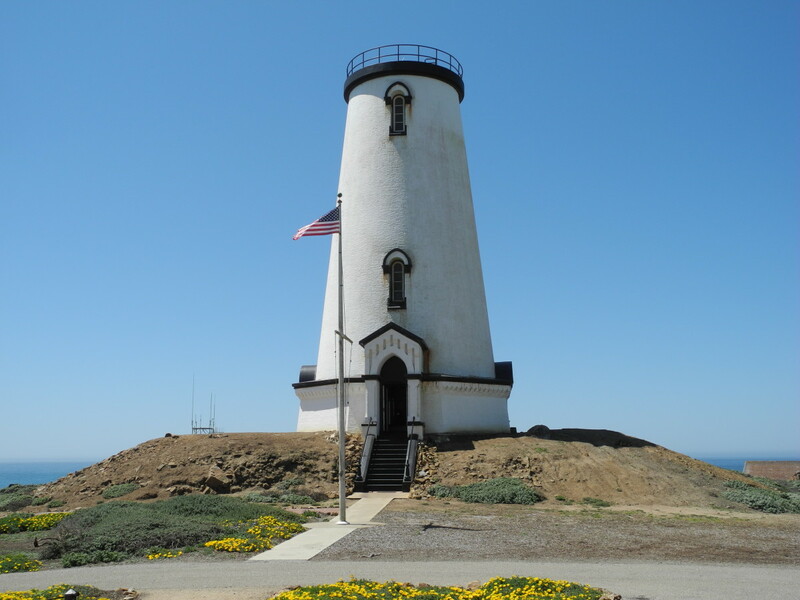 There are turnouts for scenic vistas and photographs, and the lighthouses at Piedras Blancas, Point Sur, and Point Pinos are available for tours. There is the one and only Nepenthe. At the end of the trip is beautiful Pebble Beach and Carmel, and then comes the Monterey Peninsula with its host of attractions. 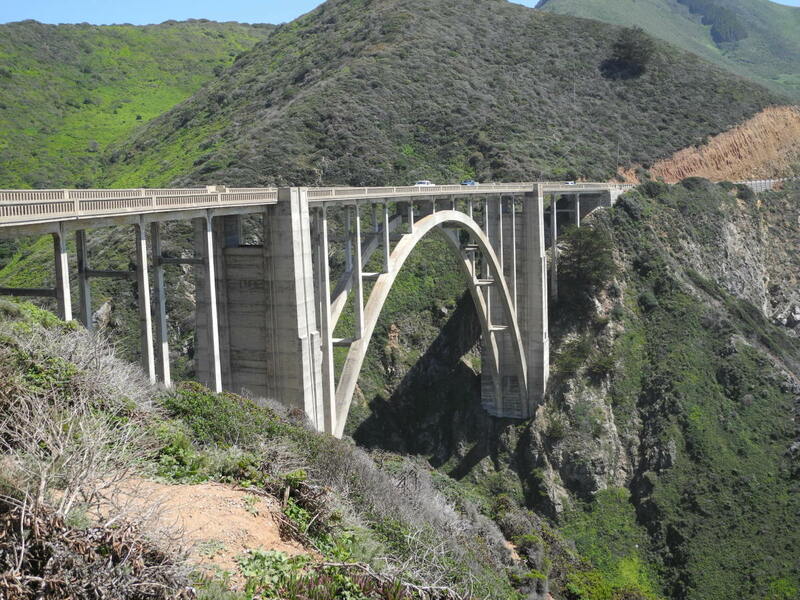 Bixby Bridge on California Highway One, built in 1932. I have made this 105 nm coastal passage by boat a dozen times, but the majority of those trips were made at night to appease the gods of angry wind and raggedy water at Point Sur, often worse than Point Conception. In the daytime there is frequent fog and normal cruising distance from shore also limits views. But on clear sunny days, the coast and mountains are majestic and breathtaking. I could see specks of cars crawling along the cliff-side highway, crossing Bixby Bridge, which looked so tiny and delicate. I want to find out. I have traveled this coastal highway a couple of times, but never looking at it comparatively with the marine trip. I want to see up close the lighthouses, seas, and shoreline that I could barely see from my boat. This area is rich in California history and beauty, and my plan is to drive up the coast, spend a few days on the Monterey Peninsula, then drive back down. I am leaving Morro Bay in the morning to head up the Big Sur coast. 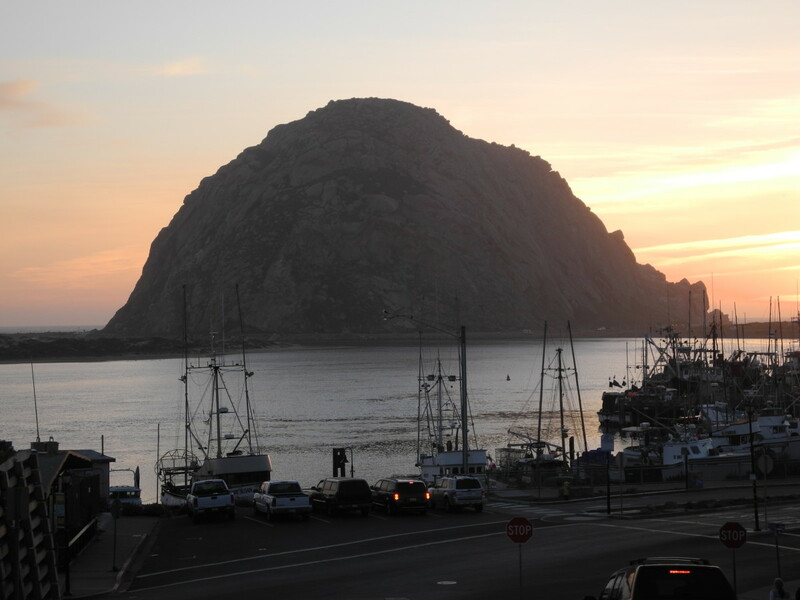 Morro Bay is a charming town, the harbor entrance guarded by Morro Rock, a 600-foot high vestige of an old volcano. It’s the best spot between Santa Barbara and Monterey for all boat services and supplies. Actually I am glad I am in my truck, since today the wind is 25 knots and the seas are running 8 feet at 10 seconds. Morro Rock guards the entrance to Morro Bay Harbor. The Embarcadero and waterfront are the heart of downtown. There are touristy shops, and also some great specialty stores and art galleries. A pedestrian walkway zigzags behind the waterfront stores, the perfect spot to watch the harbor activity. Morro Bay is home to a sizable commercial fishing fleet, so most of the restaurants along the Embarcadero feature fresh local fish (and outdoor patios overlooking the harbor). I had a killer grilled halibut sandwich at Giovanni’s, and the scallops at the Galley were superb. It was a beautiful sunny day when I headed for San Simeon Bay (now William Hearst State Beach), about 30 miles north. The seas had also calmed, running 5 feet at 12 seconds. I have anchored here many times, and it’s an ideal kickoff spot to run the Big Sur coast. This is the last place one can get ashore (the easy way) before Monterey, another 85nm north. 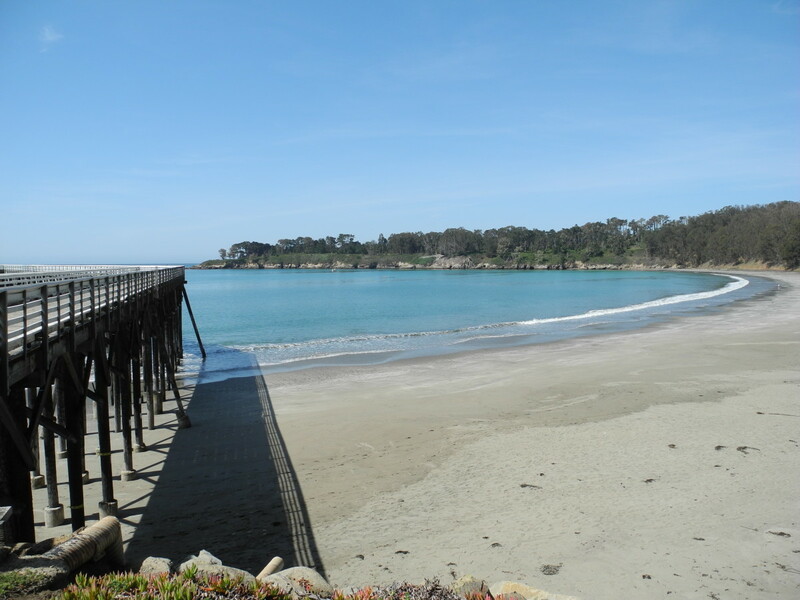 San Simeon was a whaling port in the 1800’s, and the pier still stands. Hearst Castle is due east, and all the construction material and ornate decoration for the opulent buildings were shipped by schooner from around the world and landed at this pier. Reaching San Simeon, I have just entered the Monterey Bay National Marine Sanctuary, a reserve larger than Yellowstone Park. Extending from Cambria to San Francisco through Big Sur, it contains the largest kelp forest in North America, along with the massive and deep Monterey Canyon in the middle of Monterey Bay. 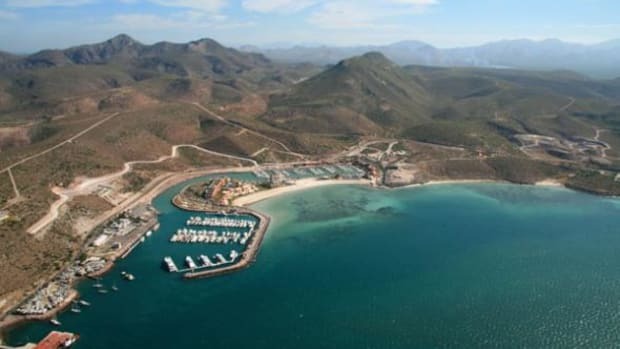 Since 1992, it has been a successful protectorate of sea life, birds, and shoreline ecosystems, while still encouraging human interaction. The anchorage at San Simeon Bay. The comeback of two marine mammals that call this reserve home has been remarkable. Both sea otter and elephant seal populations were so low as to be dangerous to the species. The sea otters now number near 3,000 and the kelp forests have recovered, since otters feed on sea urchins (who in turn feed on and destroy the kelp). 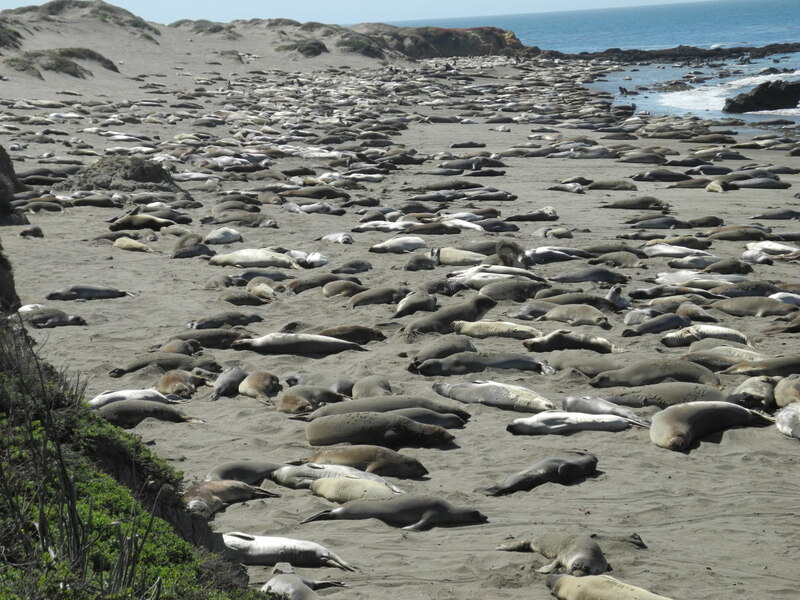 The elephant seal population in the reserve has grown to 20,000. The turnoff to the viewing area is well marked, and has a walkway above the beach, along with docents and instructional displays. They cover the beaches, flipping sand about for reasons only known to them. These are females and juveniles, not leaving the beach for the entire time of their annual molt. The males have already moved north, but will be returning to these beaches in summer for their molt. It’s an organized and efficient 12-month parade of some in, others out, one piece of their highly evolved schedule. Piedras Blancas lighthouse, operating since 1875. I stopped here on the way to taking the tour of Piedras Blancas Lighthouse, just a couple miles north. This lighthouse began operating in 1875, and continues today sending one flash every ten seconds (albeit now a halogen bulb rather than a whale oil wick). Every lighthouse has an assigned independent style and color scheme for identification, and this one stands out with its conical white tower and black trim. While originally 100 feet high, the upper 30 feet was removed due to earthquake damage. The tour includes the grounds and was well worth it. Stationed at the lighthouse at this time of year (May) are the whale counters, working for the interior department. Their job is in counting the gray whale pairs (a mother and her calf) as they head north to feeding grounds. It’s a tough job for mom to protect her small calf from orca predators, so they swim close to shore in shallow water for protection. The week I was there, they had counted 72 pairs. A few miles north of Piedras Blancas, the road and sea meet and the magic of Big Sur opens up. Framed by mountains and forest on one side, the ocean and rugged shoreline on the other, the beauty took my breath away. I was just in awe, in that extra-sensory space we all find on occasion, where continual beauty leaves you stunned. Colorful spring wildflowers spot the roadside, adding a gentle touch to the raw power of the other elements. I drove into several of the state parks along the way, and their forests and creeks could only remind me of the San Juan Islands, Moran State Park on Orcas specifically. Julia Pfeiffer Burns Park offers a highway underpass and walkway to see McWay Falls and its beautiful cove. The cove is postcard picturesque, although with our drought this year, the falls, shall we say, were struggling to add their part to the photo. Elephant seals molting on the beaches of Piedras Blancas. It was fun stopping along the way, at the local general stores, a couple of galleries and shops in Big Sur. I loved the people in the shops, the way they seemed at ease with life – the place just puts you in that kind of mood. If you wish to tarry, accommodations range the full gamut from camping in a national park to an oceanfront suite at the Post Ranch Inn. There are restaurants along the route, and a couple of gas stations as well. Coming down from the mountains and approaching Point Sur, I could feel the wind buffet me about. Point Sur itself is a huge volcanic rock, jutting out into the ocean, actually looking like an island from the sea. 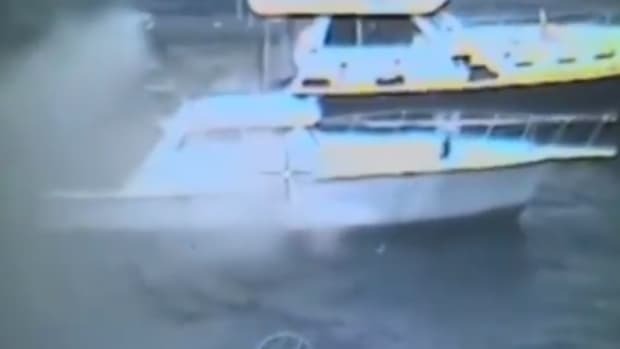 It is a frequent mess for boaters, and when I went by, the buoy reading was 8 feet at 7 seconds with 25 knots of wind. Glad to be on shore! After passing through the trees of the Carmel Highlands, the highway exit comes into downtown Monterey, then the harbor and wharves. Heading east along the waterfront leads to cannery row with its restored buildings and interesting shops. I found some original 40’s sardine can labels (Getzbest 5 Star Brand) at the American Revival shop. Doc Ricketts original marine laboratory building (made famous in Steinbeck’s “Cannery Row”) still stands, and at the end of the street is the Monterey Aquarium, unsurpassed anywhere. 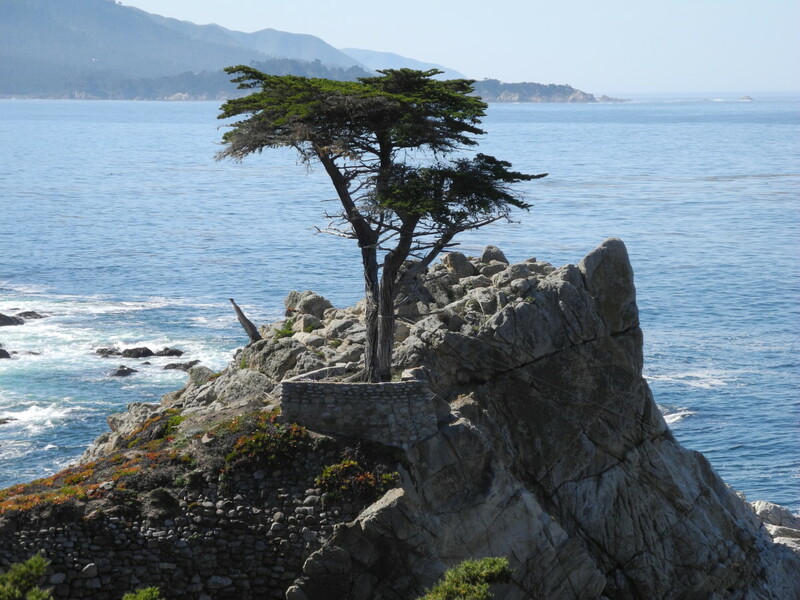 The Lone Cypress tree on 17 Mile Drive, about 250 years old. Ocean View Boulevard continues east along the peninsula shoreline, and eventually will lead to 17 Mile Drive through Pebble Beach and into Carmel, a must do. 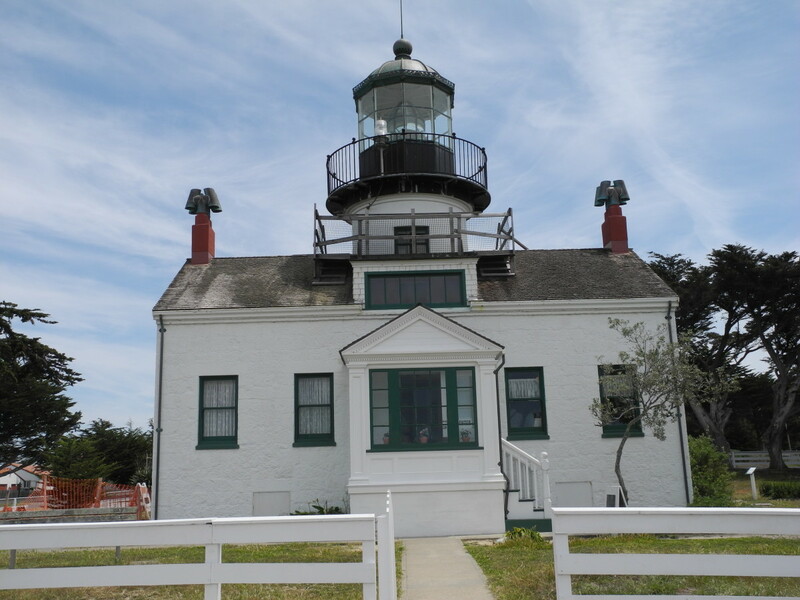 Along the way, the lighthouse at Point Pinos has scheduled visitor times, including the lighthouse keeper’s quarters. This is the oldest operating lighthouse on the west coast (1855), with a signature of 3 seconds on, 1 off. As with Piedras Blancas, whale oil is no longer the fuel du jour, and here they use an incandescent bulb in the original lens. The bay itself has had an explosion of sea life this year. North winds created an upwelling from the Monterey Canyon, bringing up nutrients and setting the food chain off and running. Anchovies and baitfish are swarming in the bay. A pod of 50 gray whales was seen just off the bay, and a school of over 1,000 dolphins was also spotted. This was the first time I ever saw squid boats making sets during daylight, since squid usually only come up at night to feed. Dinner is served, and everybody is at the table. Me included. Point Sur Lighthouse, still operating, the oldest on the west coast (1855). Make time for LouLou’s Griddle in the Middle, on the commercial wharf. Sit outside on a sunny day for a stellar breakfast or lunch. I am a longtime fan of Ablonetti Bar and Grill on the wharf, with several preparations of fresh squid on the menu. 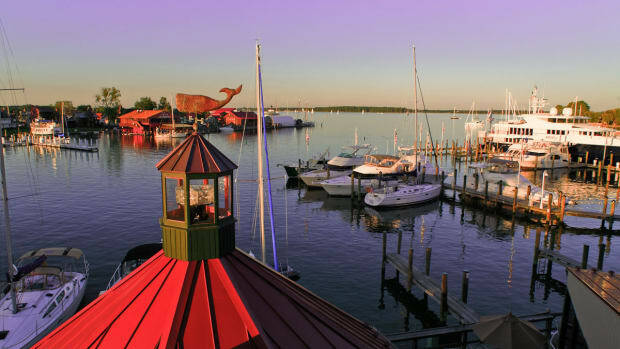 The freshest swordfish I can remember was at Gilbert’s, with a great deck overlooking the harbor entrance. With this beautiful weather, I am planning to head back down the coast in the morning. The southern trip provides easier access to the vista points, avoiding crossing the double yellow line. Big Sur has been called “the greatest meeting of land and sea in the world”, and having traveled both, I could only agree. The rugged coastline of Big Sur.